Today we partly sunny skies with calm winds. The winds were from the south-east at 5 mph and the temperatures were in the mid 50’s. Spiney dog sharks were the only report today from Cape Point in Buxton. On the colder days there have been some puppy drum down near Hatteras Inlet. There are no inshore or offshore reports for today. The Weather in Frisco was sunny today. We had south-west winds 5-10 mph and the temperatures were in the upper 80’s. The Avon beach had good catches of puppy drum and decent amounts of spot, croaker, sea mullet and bluefish. The Buxton beach report had puppy drum and bluefish caught. Out at Cape Point the spanish mackerel and bluefish bite on lures was good today early in the morning and late in the afternoon. Over on the Frisco beach the puppy drum made a showing along with sea mullet and pompano. The inshore boats had good speckled and gray trout fishing. 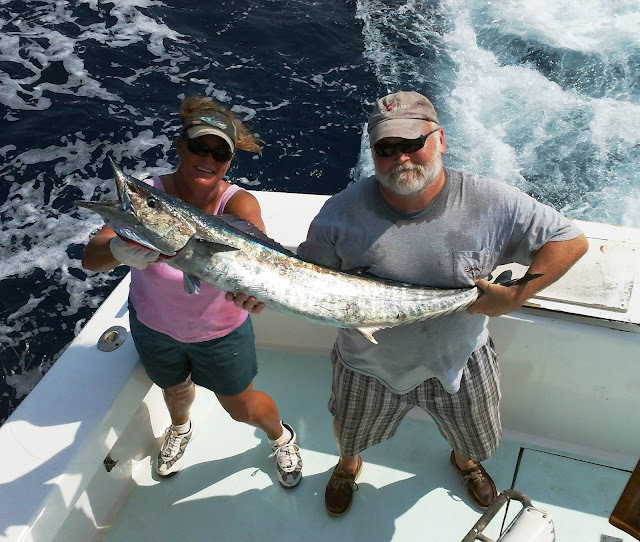 The offshore fleet had good catches of wahoo and a few dolphin. Below is the “Native Son” charter boat with one of the 10 wahoo’s they caught today. The St Croix Triumph rods are made of great quality at a reasonable price. Available in 9′, 10′ and 10′ 6″ spinning, which are perfect for casting lures out at Cape Point for the spanish mackerel and bluefish. We have a whole new selection of Woolrch Fall clothing in stock. Come by and see us at Frisco Rod and Gun, located at 53610 Hwy 12, across from Billy Mitchell Airstrip and Ramp 49. The Weather in Frisco was mostly sunny today. We had south-west winds 5-10 mph and the temperatures were in the mid 80’s. The Avon beach was pretty productive today with puppy drum, sea mullet, spots, croakers, bluefish, and some spanish mackerel caught. Out at Cape Point the spanish mackerel and bluefish bite was good this morning and decent this evening. The Frisco beach was decent with some sea mullet, pompano and bluefish caught. The Hatteras beach had bluefish,flounder ,sea mullet and pompano reported. The inshore speckled trout fishing continues to be good in the Pamlico Sound along with bluefish and flounder. The bluefish bite out on the shoals at Cape Point was excellent with some nice spanish mackerel mixed in. The big red drum made a showing too but the bluefish would not let them eat. Offshore today was a little slower. Good wahoo fishing and a scattered dolphin bite. A few nice grouper and triggerfish caught and a sailfish released. Below the “Godspeed” charter boat with one of the four wahoos that caught today. Gunslick Ultra-lube’s advanced formula is the ultimate in lubrication technology. 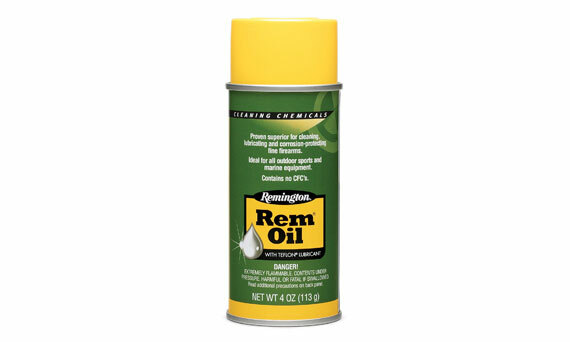 It bonds to metal surfaces for superior lubricity, and offers layers of powerful protection against corrosion. After a full day or week of dove hunting, which starts tomorrow morning, Gunslick’s Ultra Lube is a must to keep your firearm clean a shooting flawlessly. Today was nice and sunny. The winds were light out of the north-east at 10 mph and the temperatures were in the mid 50’s. Down on the Buxton beaches there were a few speckled trout caught. A t Cape Point there still plenty of sharks and skates being caught. Down the south beaches in Frisco and Hatteras there have been a good amount of blow toads around. Offshore fishing today was a little slower but the seas were calm. 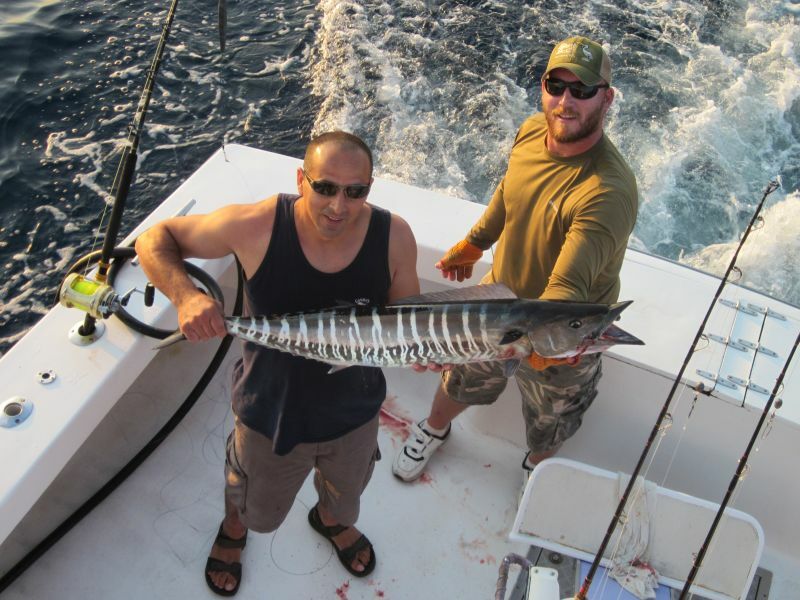 A few wahoo, king mackerel and some black fin tuna were reported. We have all of our In store Woolrich clothes on sale at 30% Off. Come by and see us at Frisco Rod and Gun!!! This Plano Gun Maintenance Station is a great for cleaning and storing all of your gun cleaning supplies. Made of a weather restistant construction its great for taking it on the go.